"What do Angela Merkel, Hillary Rodham Clinton, Christine Lagarde, Oprah Winfrey, Sheryl Sandberg, JK Rowling and Beyoncé have in common?" was the headline in the English newspaper The Observer in 2014. "Other than riding high in Forbes list of the world’s most powerful women," journalist Tracy McVeigh wrote in answer to her own question, "they are also all firstborn children in their families. Firstborn children really do excel." So what does it mean to be an eldest daughter? Firstborns Lisette Schuitemaker and Wies Enthoven set out to discover the big five qualities that characterize all eldest daughters to some degree. Eldest daughters are responsible, dutiful, thoughtful, expeditious and caring. Firstborns are more intelligent than their siblings, more proficient verbally and more motivated to perform. Yet at the same time they seriously doubt that they are good enough. Being an eldest daughter can have certain advantages, but the overbearing sense of responsibility often gets in the way. Parents may worry about their ‘difficult’ eldest girl who wants to be perfect in everything she does whilst her siblings may not always understand her. "The Eldest Daughter Effect" shows how firstborn girls become who they are and offers insights that can give them more freedom to move. And parents will gain a better understanding of their firstborn children and can support them more fully on their way. Lisette Schuitemaker founded, ran, and sold a communications company before becoming a healer, life coach, and personal development author. She studied the work of Wilhelm Reich as part of obtaining her BSc in Brennan Healing Science. She is the author of The Childhood Conclusions Fix and Childless Living and co-author of The Eldest Daughter Effect. Lisette lives and works in Amsterdam, Netherlands. Wies Enthoven is a writer, journalist and teacher. Her focus is always on the narrative people tell her. How do they look at themselves? What is their life story? Being an eldest daughter, she discovered how much women in this position have in common. "I am an author, writing coach and publisher, and an eldest daughter; my business partner is the youngest brother of three sisters. After reading The Eldest Daughter Effect I understood exactly how our relationship worked, its positives and negatives. I was amazed to find what a typical eldest daughter I am, and that so much of my attitudes and behaviour are coloured by this factor. The book has led me to have endless, fascinating conversations with others I can now easily identify as eldest daughters -- and I will be recommending it to all of them. If you are an eldest daughter, you MUST read this book!" "Like looking at a reflection in the mirror--shrewdly discerning and comically accurate. This book uncovers the mysteries of why we eldest daughters are who we are. Valuable for those seeking insight into the eldest daughters in their lives. Even better for eldest daughters trying to understand their own profound sense of responsibility, expeditiousness, and perfectionism." "The Eldest Daughter Effect is a page turner. I couldn' t put it down and raced through it in one go!! Now I want to share the book with all my good friends - who of course are eldest daughters themselves - my walking buddy, my step daughter and many professional colleagues. The five qualities of Eldest Daughters (responsible, dedicated, expeditious, thoughtful, caring) even emerged as key descriptors of me in the systemic constellation inquiries I have done with my community of practice - so I affirm these research discoveries. I am indebted to Lisette and Wies for their insights, so beautifully captured in lively vignettes and flowing prose that offer a truly rewarding read. Brava!!!!" "Using the Grounded Theory research method, these authors set out to discover whatever they could about first born women. They ended up with five common traits (responsible, dutiful, hands on, thoughtful, and caring) shared by eldest daughters. Both eldest daughters themselves, they found that the insight gained from their discoveries was extremely helpful. They are sharing the paradigm which they developed from their research with readers, hoping that the information will prove useful to them as well. More than just broad strokes, Schuitemaker and Enthoven get down to the nitty gritty, covering topics like the 'Functional Eldest Daughter', the first four years, the danger of wanting to be perfect, unrealistically high expectations of the first born, effects of undivided attention, why eldest daughters tend to be smarter, 'Dethronement', 'Impostor Syndrome', the undervalued role of the father, and the inseparable connection to those the eldest grew up with. I am an eldest daughter and I found this book to be both enlightening and liberating. Written as much for siblings of the eldest as for the eldest themselves, this is a highly detailed analysis of this particular family dynamic. It offers exercises so the reader can self-evaluate in order to apply the information to themselves. Clearly written and relevant, it’s a valuable resource for parents as well as adult eldest daughters and their confused siblings." "Lisette Schuitemaker discusses the characteristics and possible advantages or challenges of being an eldest daughter, and also how the birth order of a child influences their developing view of themselves and the world. READ THIS BOOK to discover some of the qualities that distinguish the first born, which include an extraordinary sense of responsibility, a tendency to take the lead, a fear of making mistakes, being hit hard by criticism and caring for others to the point of exhaustion. First-born children sometimes have an innate intelligence and do better at school than their younger siblings and often become accomplished leaders in whatever field they chose to go onto. We also will discover the characteristics of the second child and middle child, and how they also develop qualities which help the family to be more united. Each child offers special advantages for the family unit. 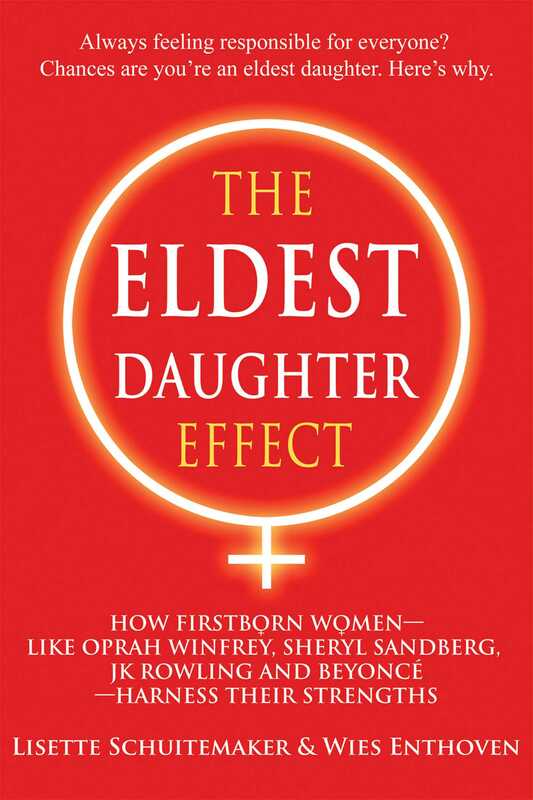 Some of the eldest daughters discussed in this book are, Sheryl Sandberg, Lady Gaga, Whoopy Goldberg, and Meryl Streep. A good read for eldest children and parents wishing to know more about the uniqueness of their children, and also for understanding that the family is a unit where everyone finds the space to express themselves."